ARP's Valve Cover Stud Kits ensure proper sealing of valve covers for a variety applications. Valve cover studs offer the ability to properly position the gasket and guide the cover into position, avoiding any pitching or miss-aligning. These stud kits come in choice of chrome moly steel with a black oxide finish or polished stainless steel and conventional hex head nuts or compact 12-point nuts. Hex nuts feature a wide base for better load distribution and sealing, while the compact head is easily accessible. Stud kits come complete with washers. 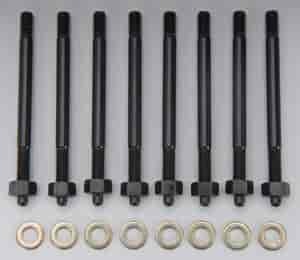 Also available are ARP's Valve Cover Bolt Kits.